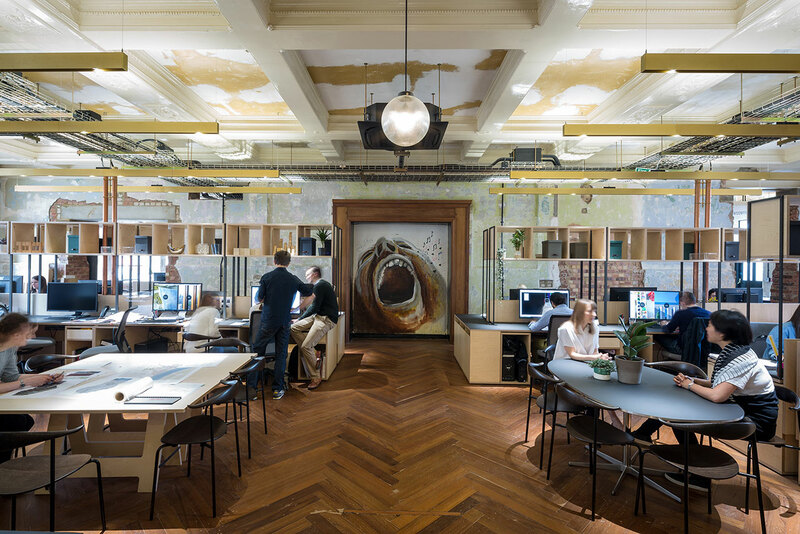 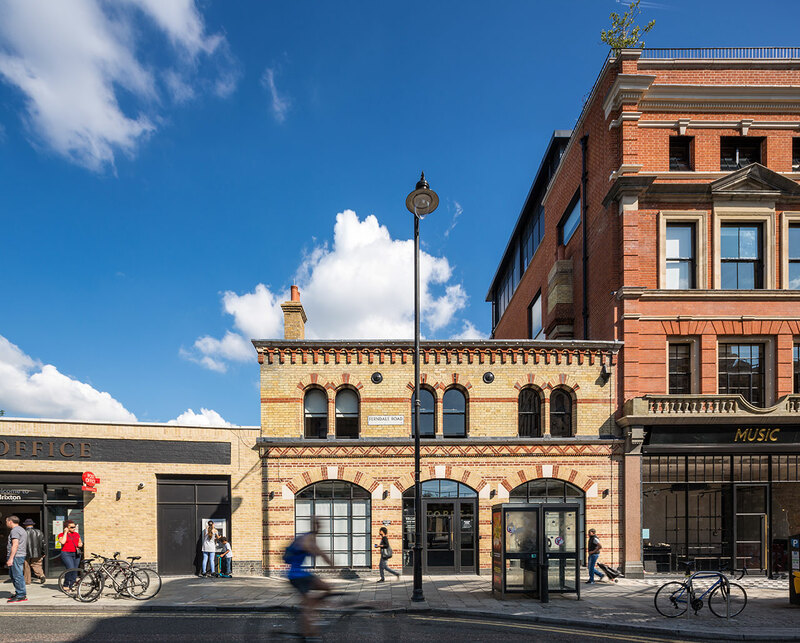 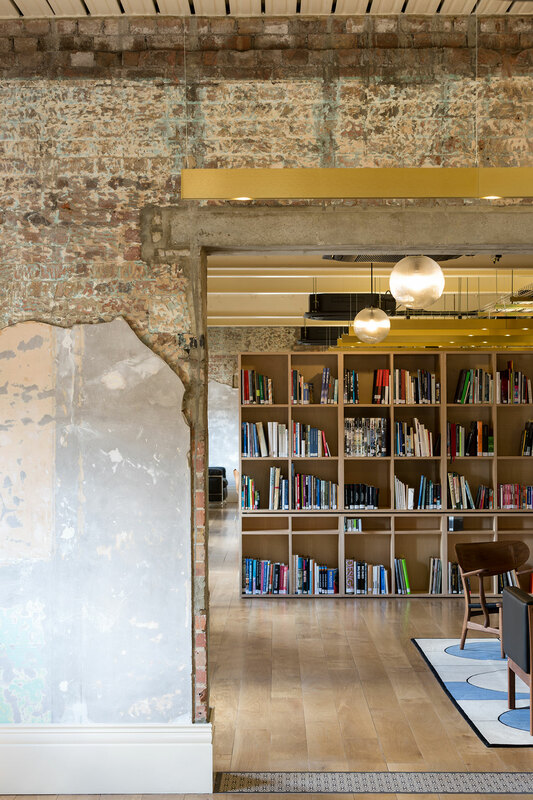 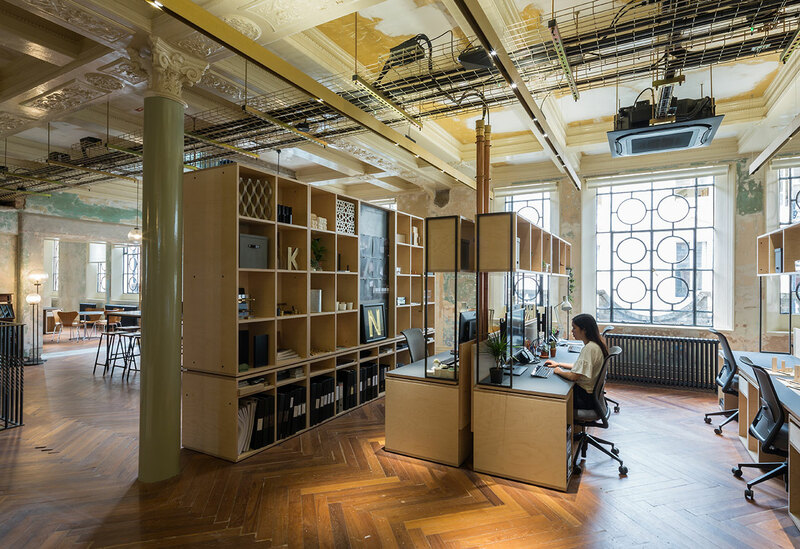 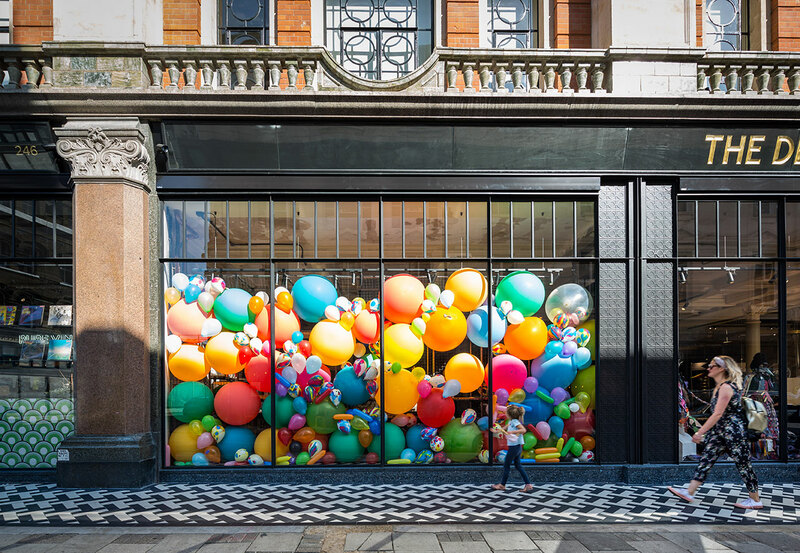 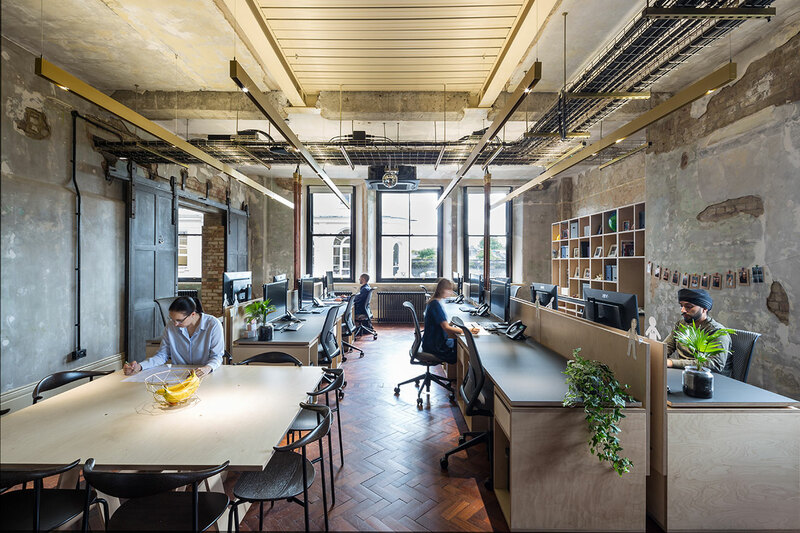 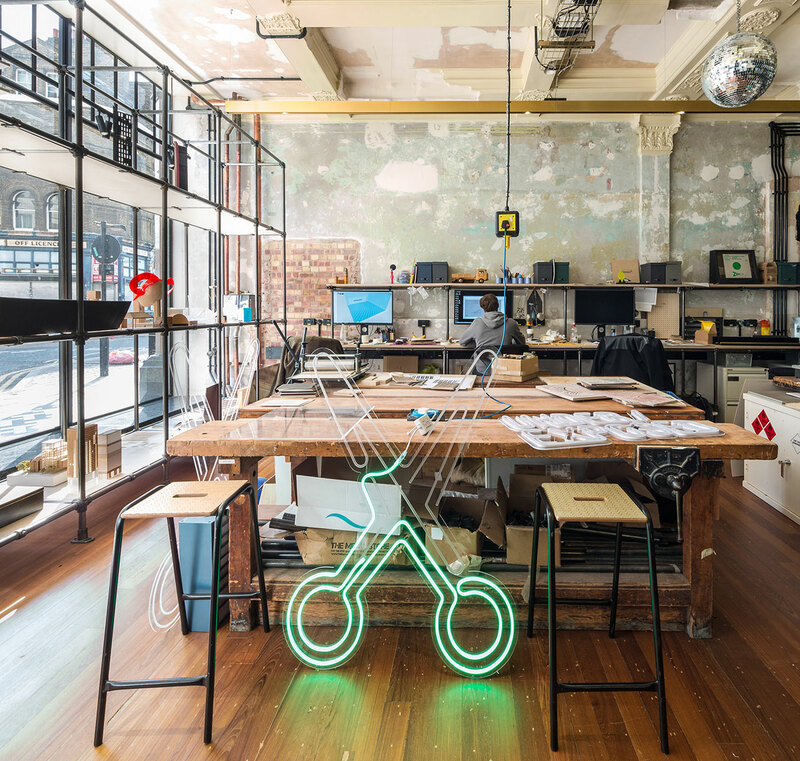 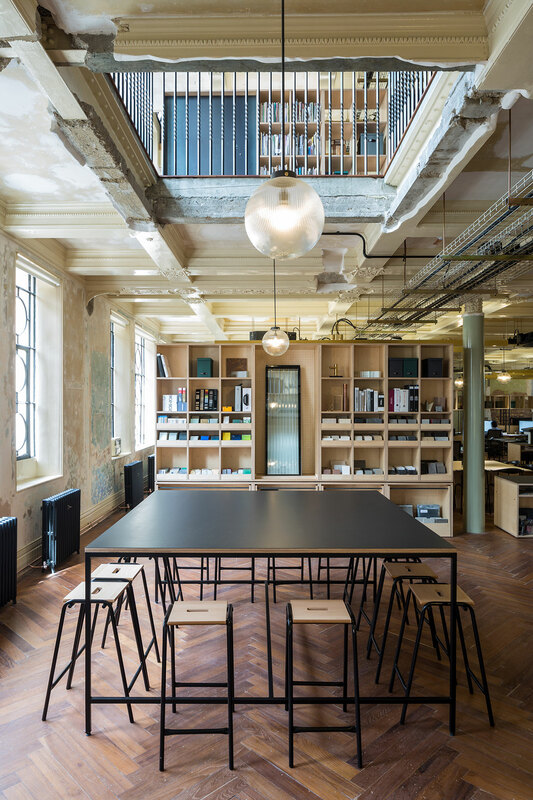 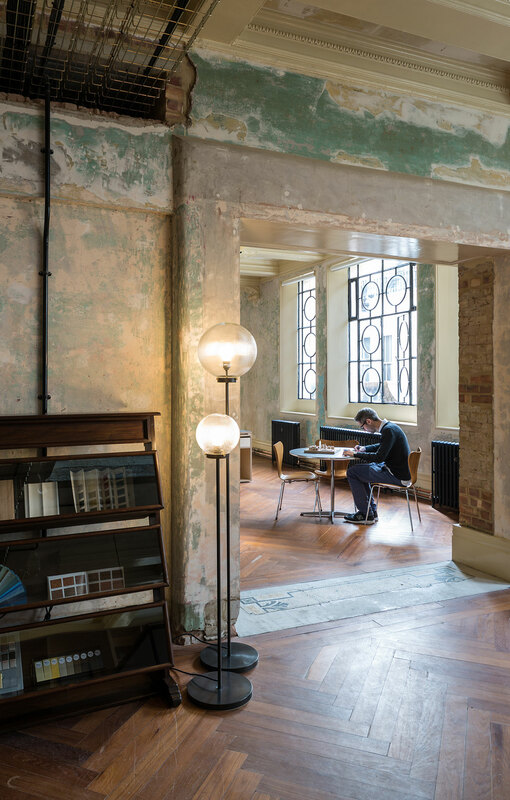 London-based architecture and design practice Squire & Partners are no strangers at transforming centuries-old buildings into contemporary workspaces, so when it came to finding their new headquarters they had no qualms in choosing a dilapidated, four-storey Edwardian department store in Brixton. 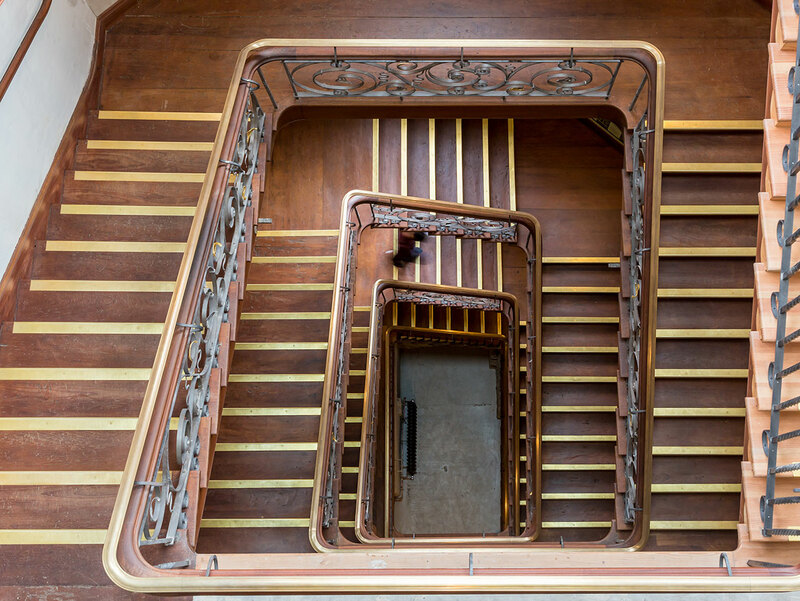 Stripped down to reveal its original core, the building’s decayed grandeur was brought to the fore as a testament to its commercial and architectural legacy as well as a tribute to the artisans of the day whose extraordinary commitment to craftsmanship is mirrored in the work of the craftspeople and furniture makers who collaborated with Squire & Partners. 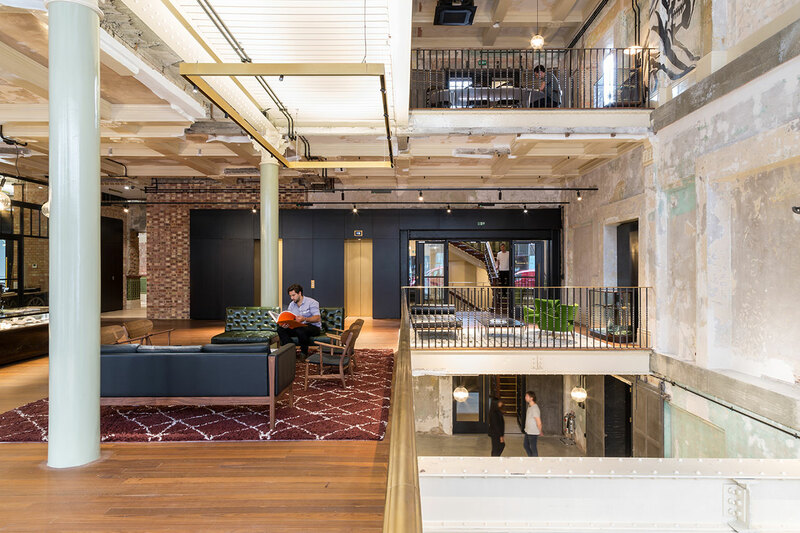 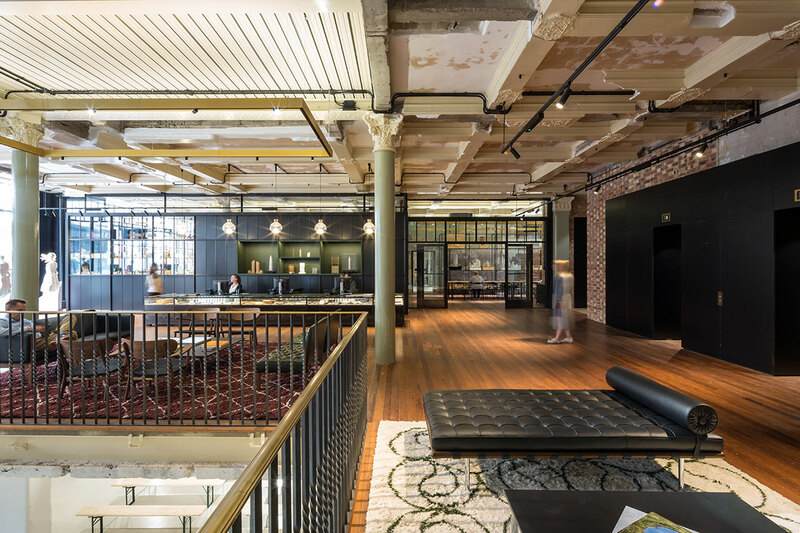 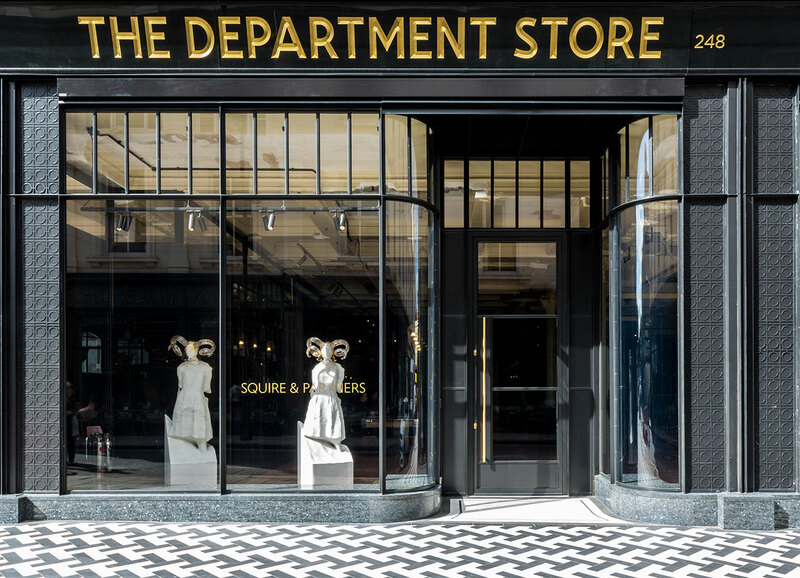 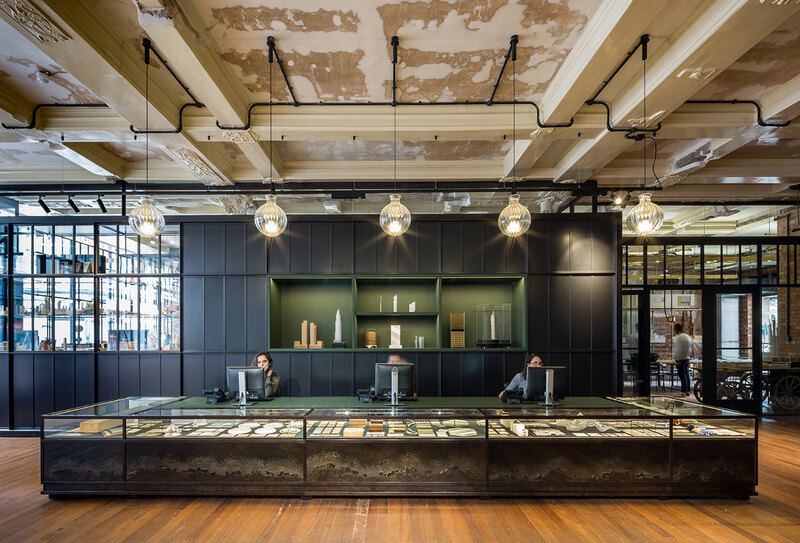 Guided by the layers of history and grounded in a series of bold architectural interventions, the repurposed building, aptly called 'The Department Store', has been transformed into an inspiring modern workspace, winner in the Office category at the 2018 INSIDE World Festival of Interiors Awards, and an exciting new edifice for the entire neighbourhood. 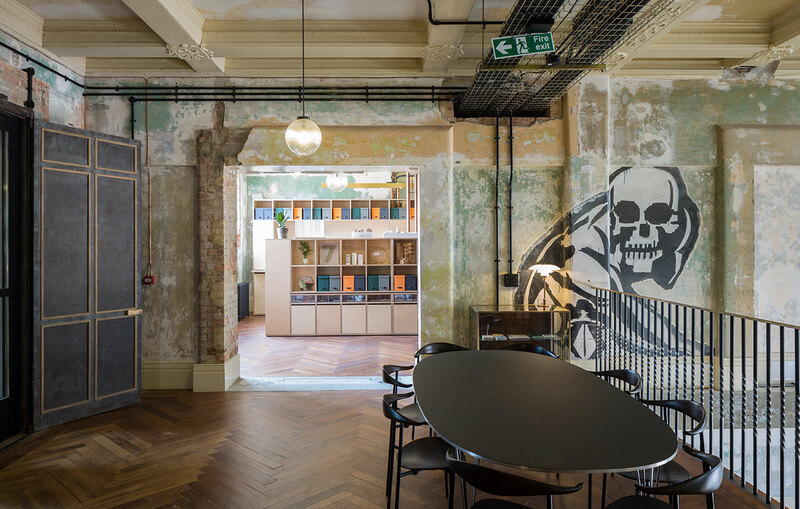 Built in 1906 as an annex to the Bon Marché store across the road, the building was converted into offices in the 1950s but was abandoned in 2012 and subsequently used by squatters as attested by the large swathes of graffiti that the architects encountered when they purchased the building in 2015, along with a family of adjacent buildings including a former horse and cart Fire Station. 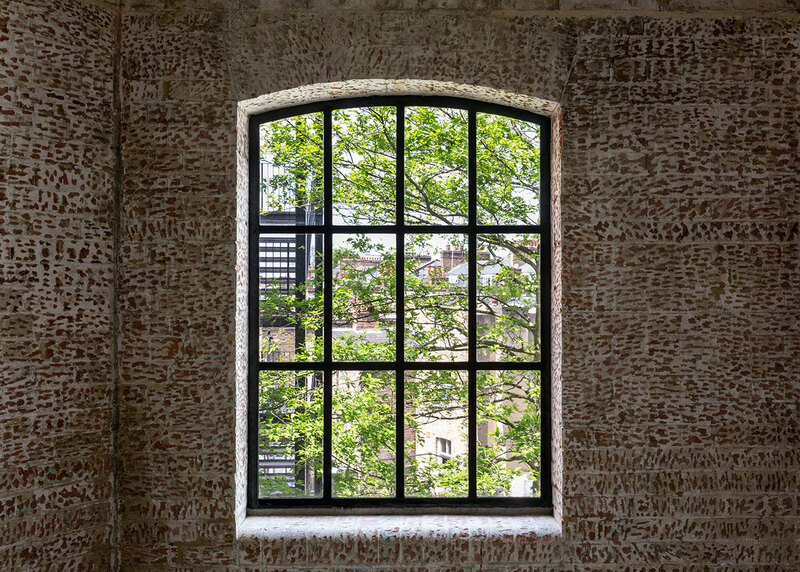 Two years of extensive renovations later, which included the insertion of a series of dramatic voids providing vistas between floors, the addition of a rooftop level and the replacement of the derelict cupola with a stunning crafted glass dome, Squire & Partners’ new headquarters are exciting new edifice for the entire neighbourhood. 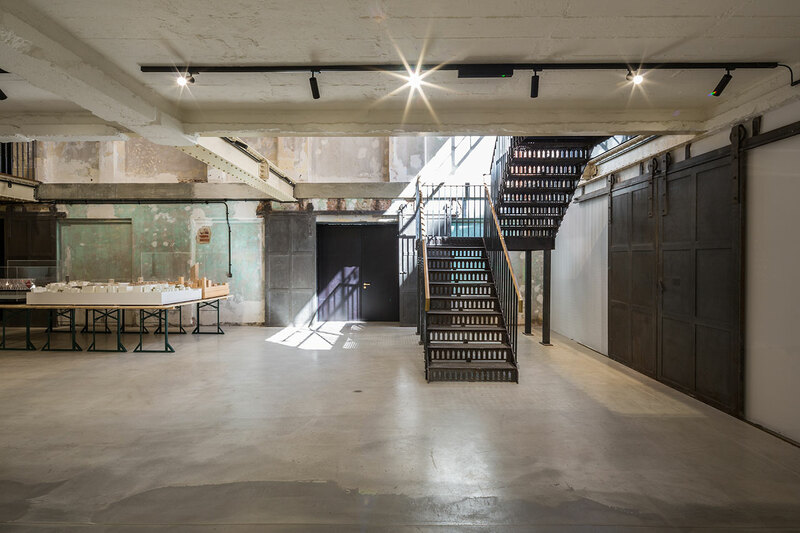 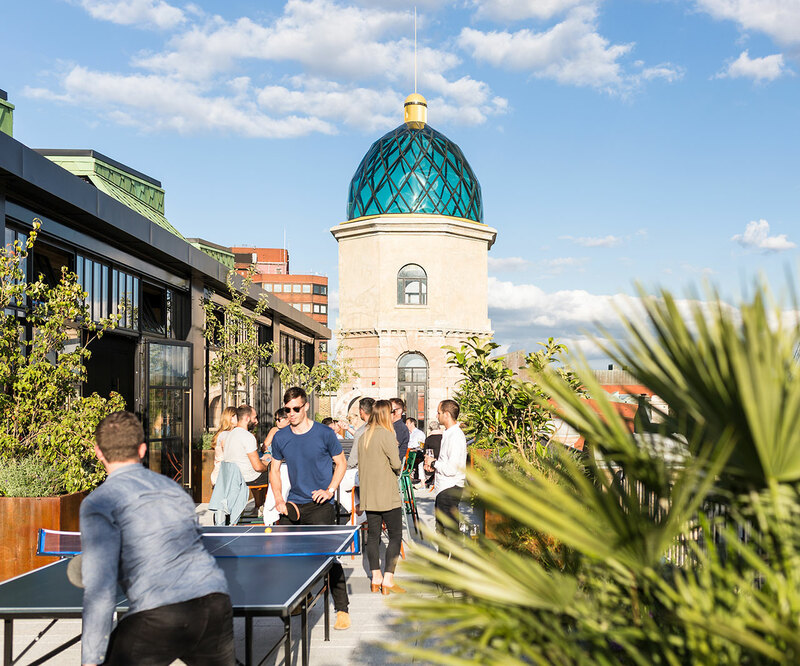 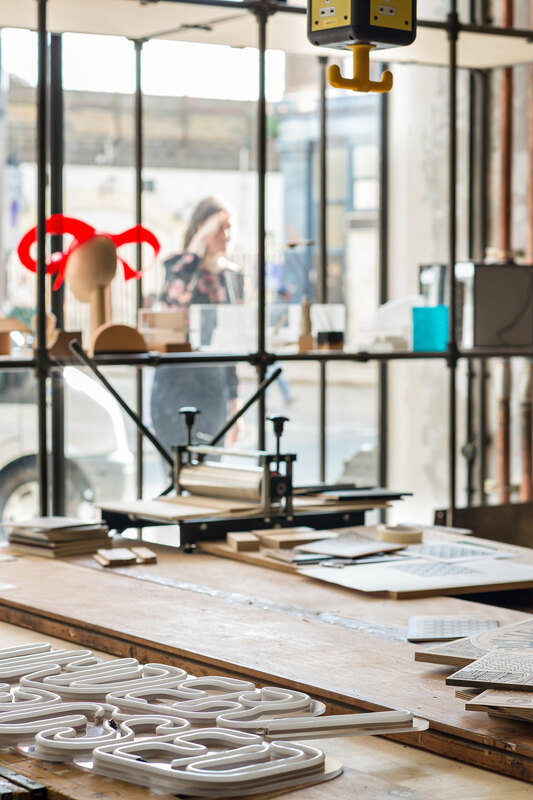 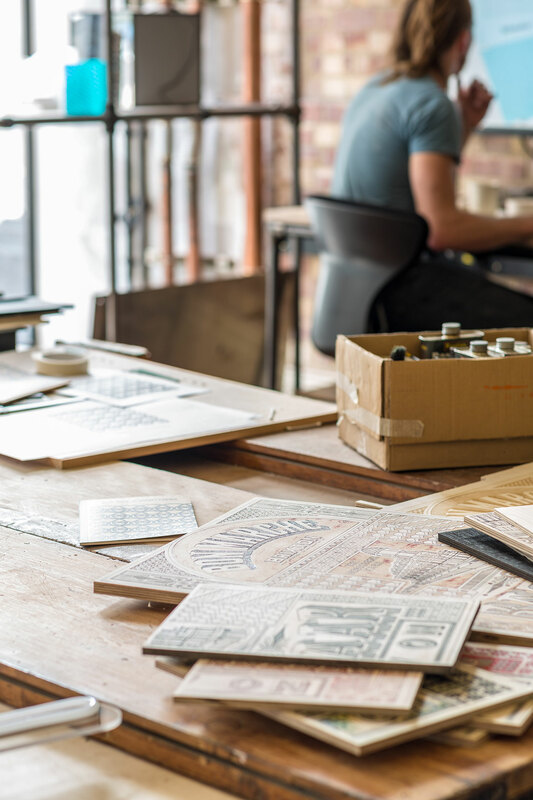 Apart from the practice's workspace the building also encompass on the ground floor a café, a local record store, a community Post Office, and a bar-restaurant, as well as events spaces in the basement level and a new rooftop restaurant. 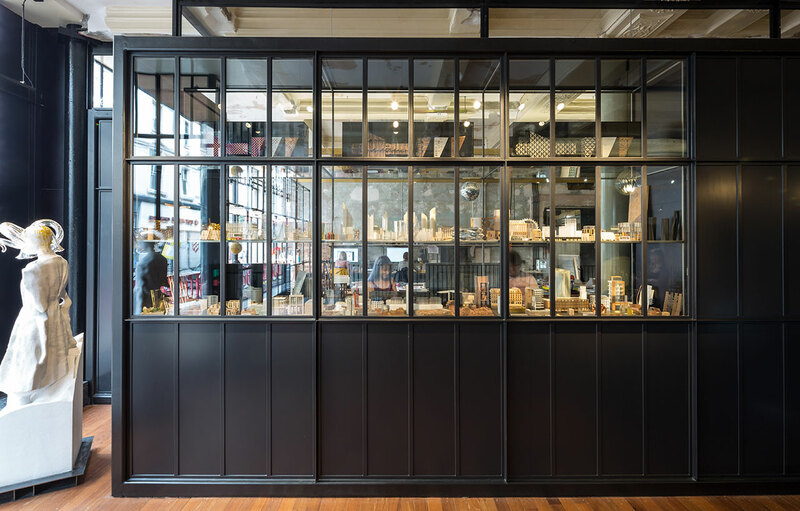 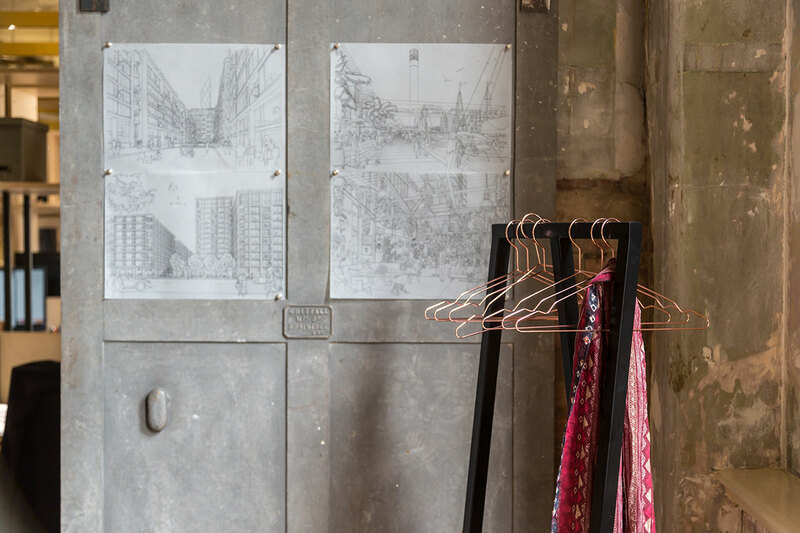 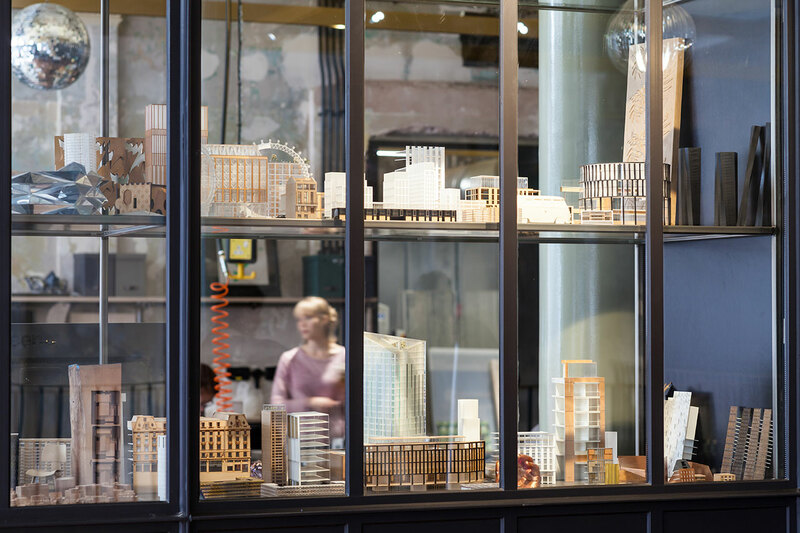 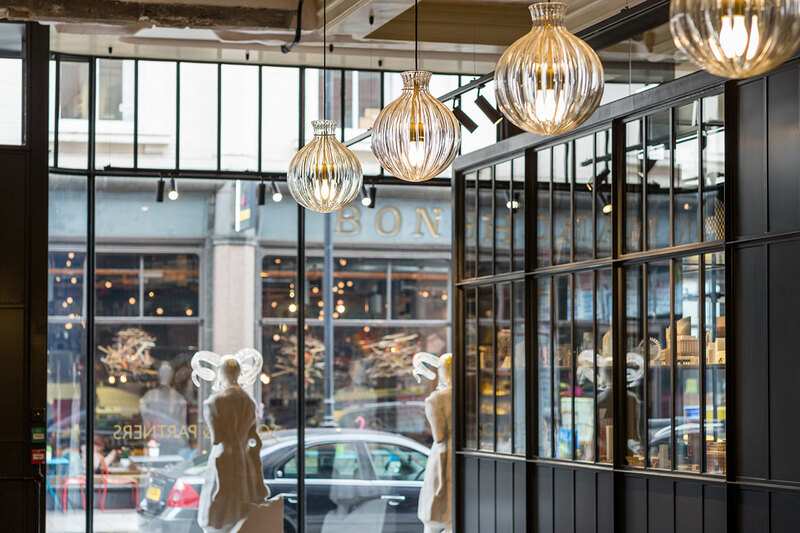 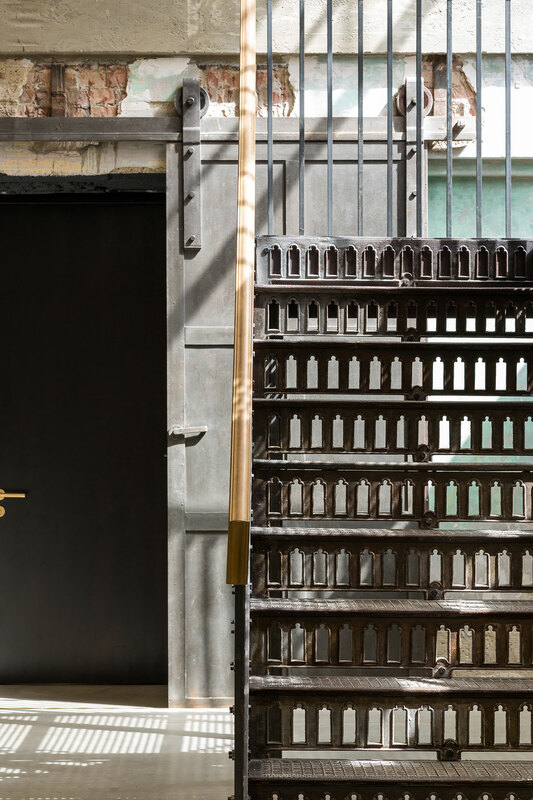 On the ground floor, the building has been ‘opened up’ to the neighbourhood by the inclusion of Squire & Partners’ in-house model workshop which the public can catch glimpses of though the restored shopfronts. 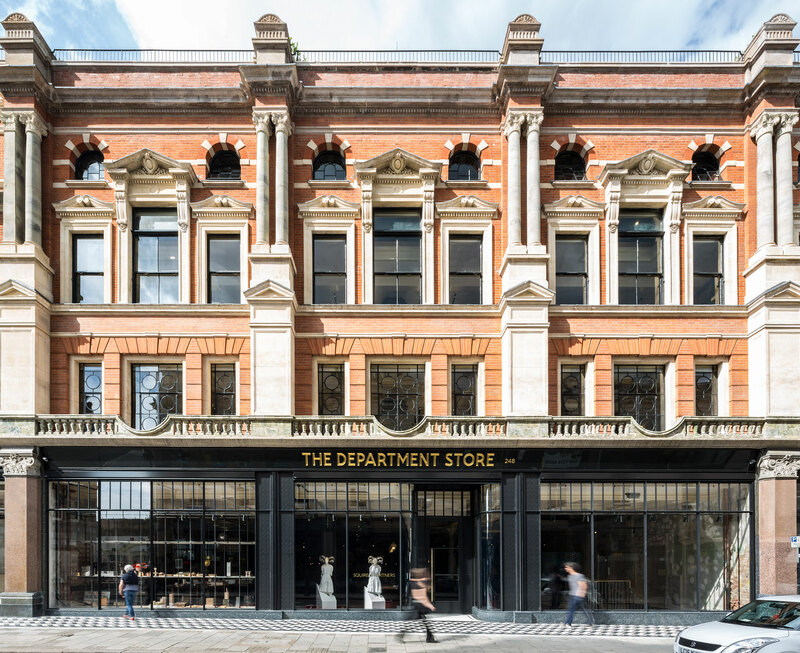 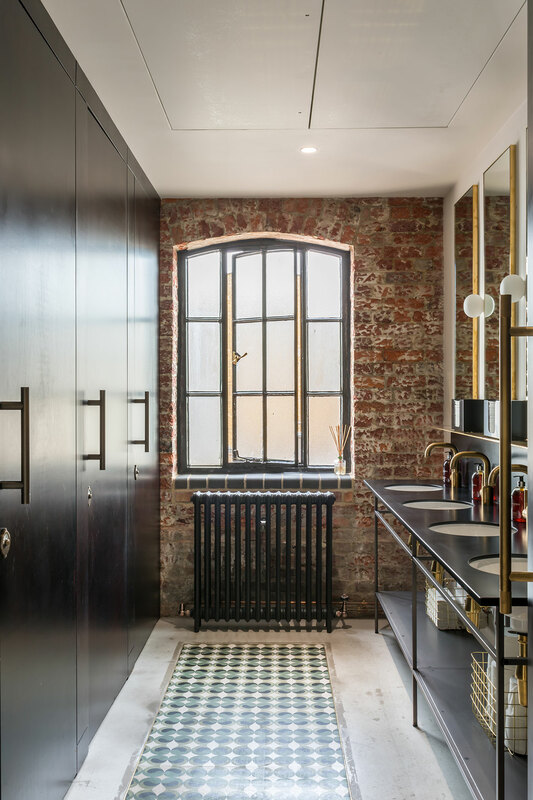 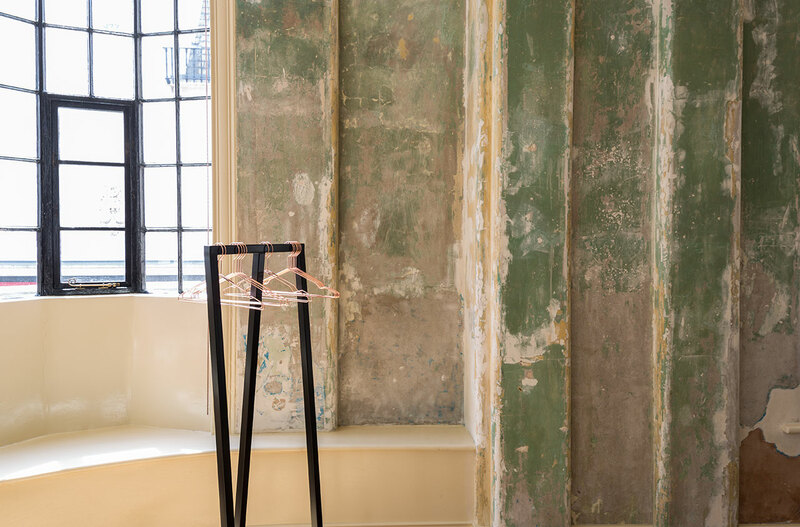 Along with the restoration of the façade’s original brickwork, stone, marble and terracotta finishes, and the introduction of a continuous run of monochrome herringbone tiles, the building’s exterior has reclaimed its Edwardian finesse. 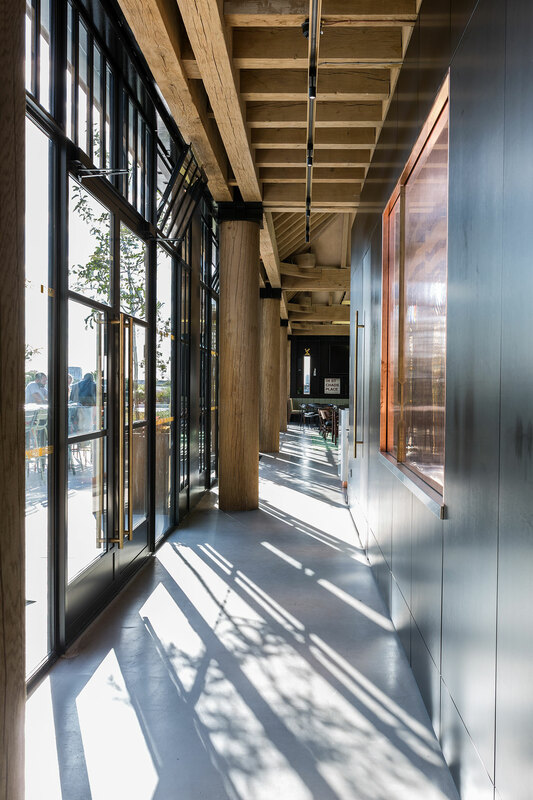 The glass-fronted reception woos visitors with a triple height void that connects the ground floor with both the workspaces above and the events space downstairs, as well as with the 6.5m long bespoke reception desk. 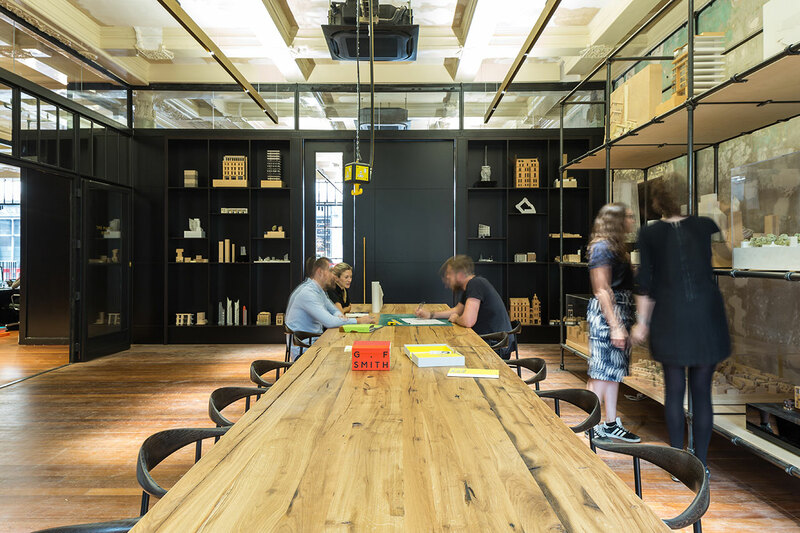 Manufactured by specialist cabinet makers Interior iD and material artists Based Upon, the desk was conceived as a haberdashery display to showcase the practice’s current projects. 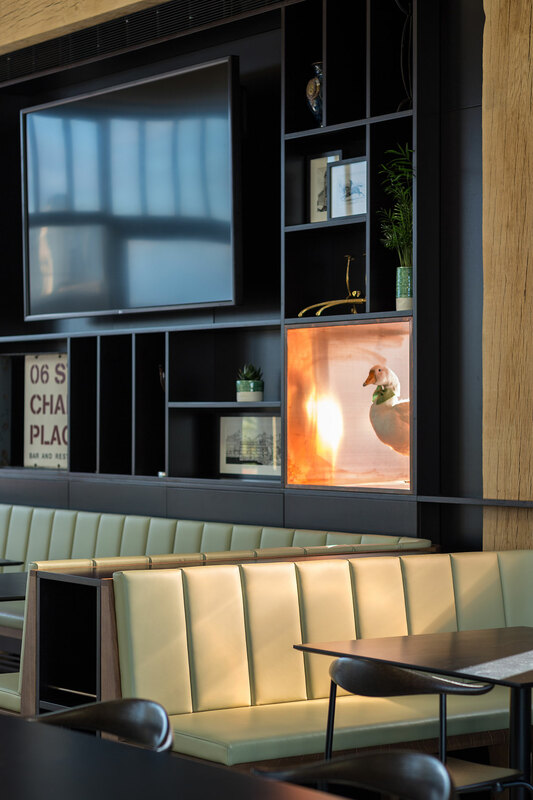 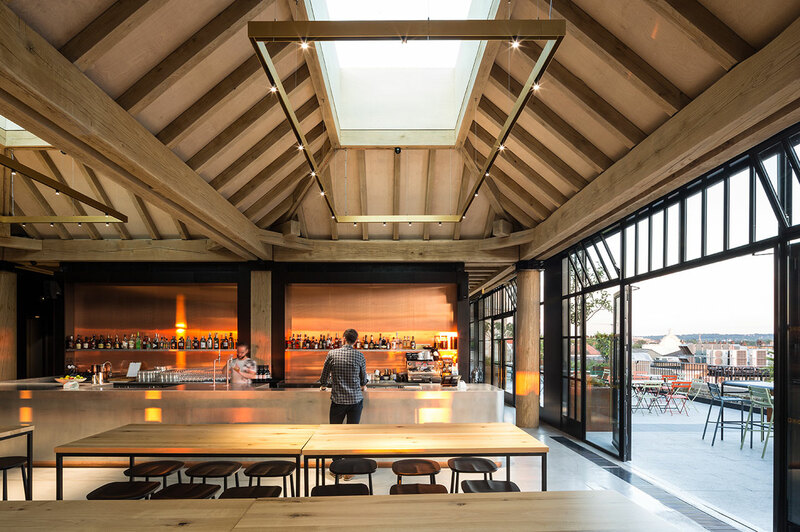 As impressive, the original Burmese teak flooring that dates from 1906 was meticulously restored, while exposed services ensure that the original ceilings could also be revealed. 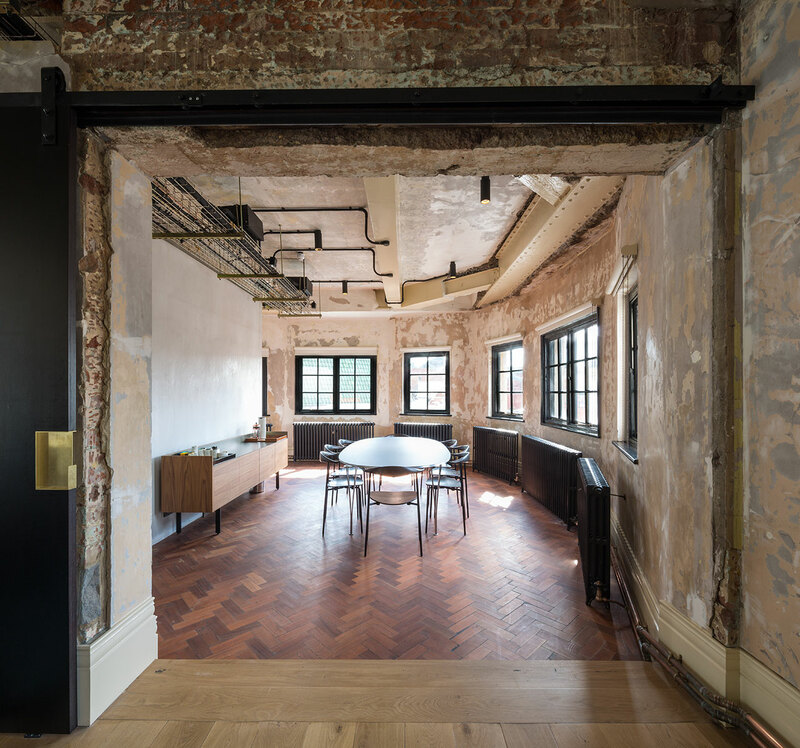 The restored parquet floors are complemented by handmade rugs by Laguna, whose patterns by Brixton based designers Eley Kishimoto were inspired by motifs found within the original building. 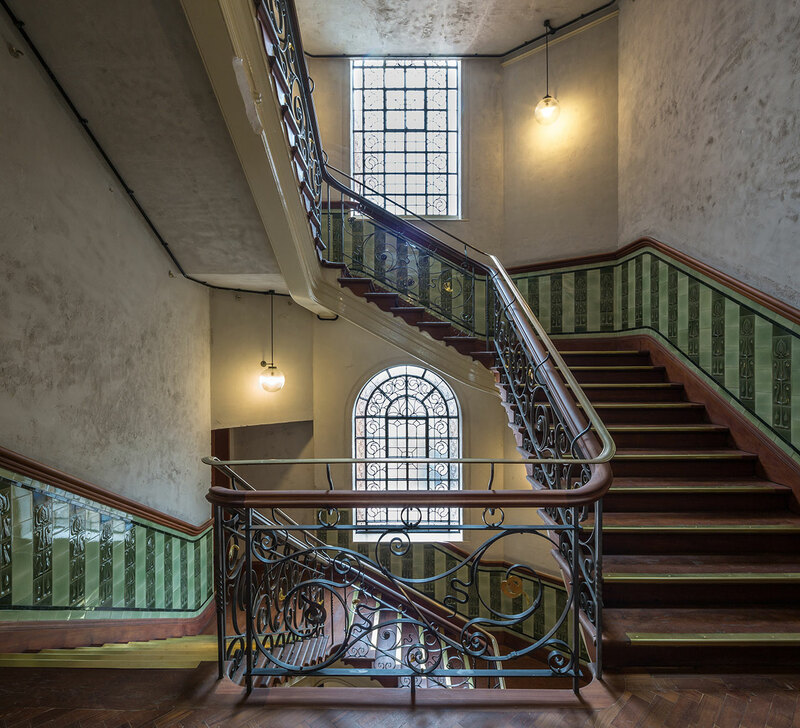 Original parquet flooring was also restored on the upper floors in the form of chevron mahogany, while the uncovering of the building’s grand central staircase revealed more original elements such as decorative metalwork, carved mahogany handrails, green patterned tiles and stained glass windows displaying a variety of organic motifs, all painstakingly restored to their past glory and complemented by a new timber framed roof lantern. 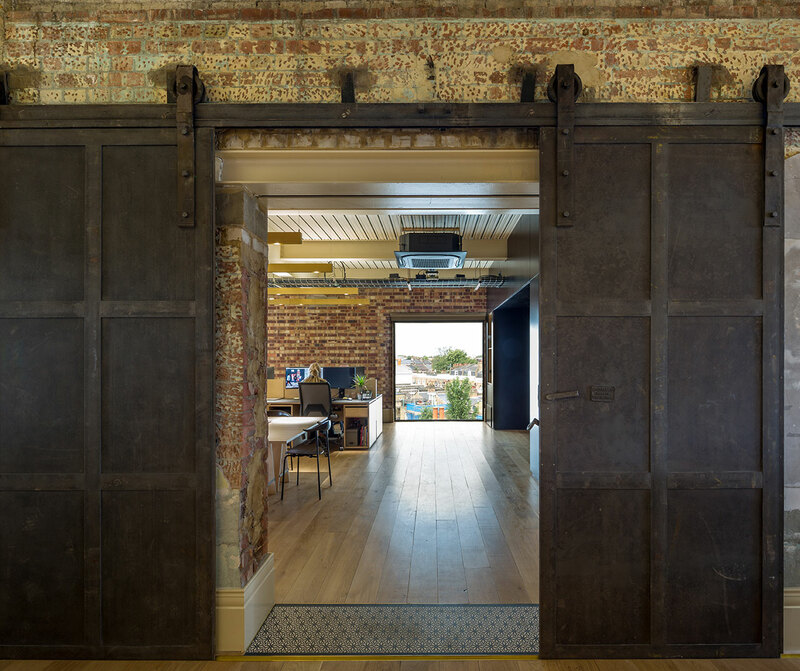 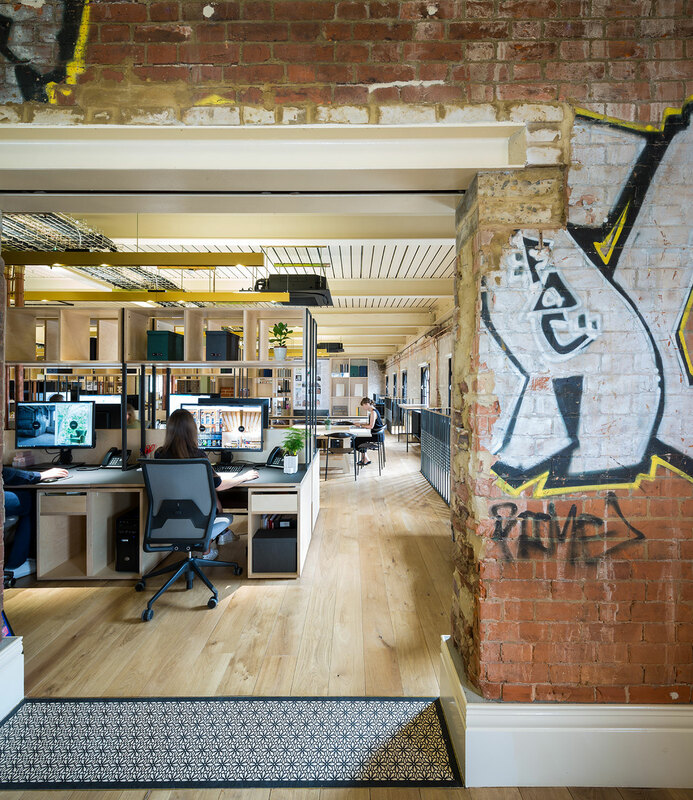 The architects’ archaeological approach centered on the preservation of the building’s fabric ‘as found’; exposed brickwork, weathered plaster and a remarkable patina of colours that were revealed during the renovation adorn the office spaces as do elements of the building’s more recent past as a graffiti-laced squatters' paradise such as the singing man encased within a timber framed arch on the first floor and the crouching skeleton that can be seen in the central void. 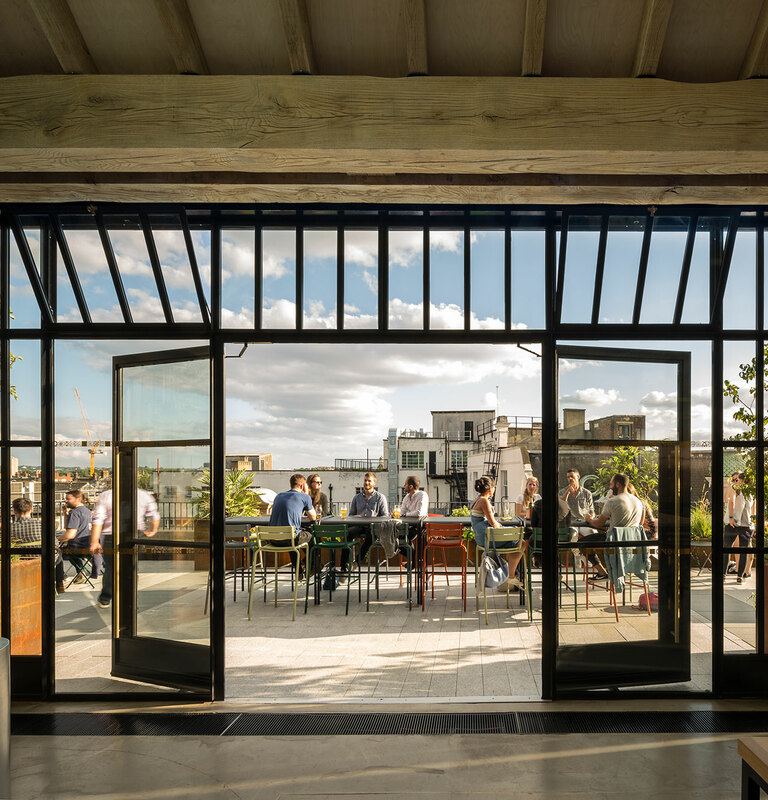 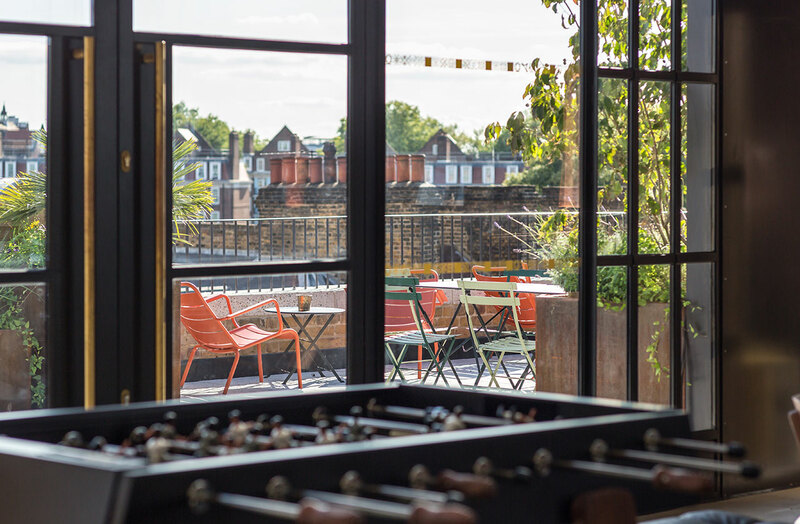 On the building’s rooftop, the architects have designed a series of oak framed pavilions with copper shingle roofs to house a new social space that includes a bar, lounge area and dining for the practice’s 220 staff plus guests, as well as a landscaped roof terrace. 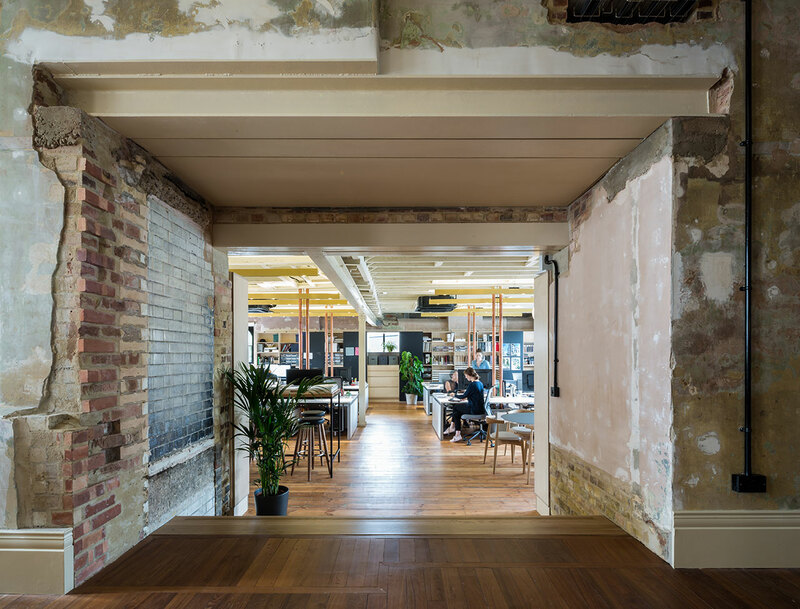 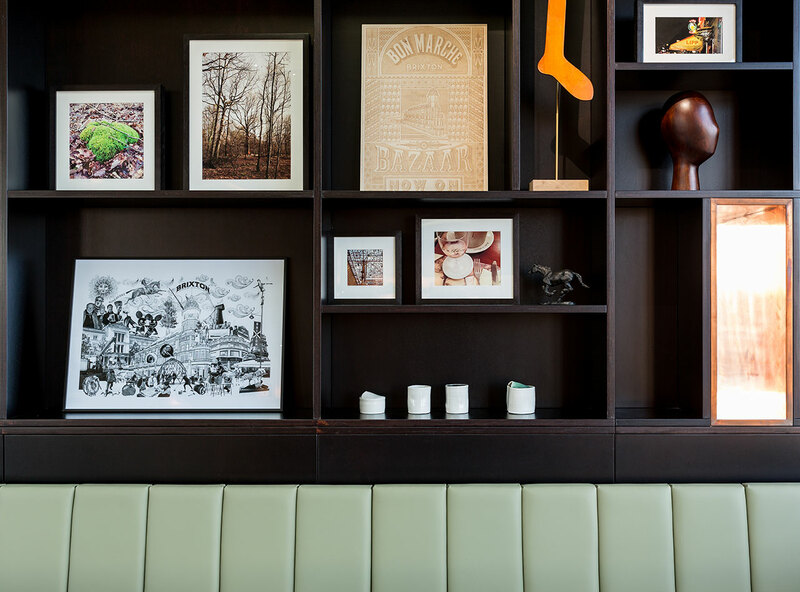 Featuring pale green leather banquettes and smoked oak chairs around black ply topped tables in the dining room, a full height copper-clad wall housing a wood burner in the lounge, and an elongated bar counter of untreated pewter coupled with black timber bar stools, the space combines a relaxed ambience with an effortless sophistication. 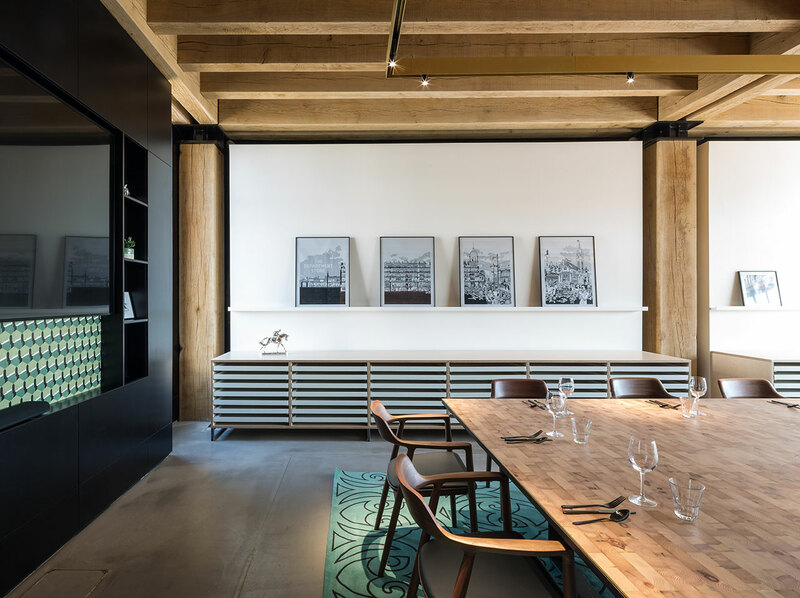 There is also a separate space that functions as a large meeting or private dining room centered on a bespoke dining table created in collaboration with Opus Magnum using end grain from the building’s salvaged pine beams. 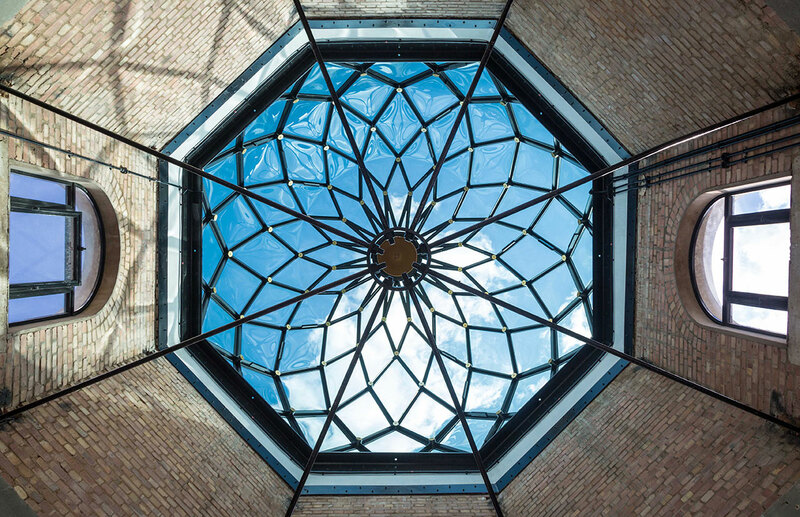 Replacing the original copper structure, a bespoke glass and steel dome created in collaboration with Swiss specialist manufacturers Tuchschmid crowns the building’s corner tower in the most elegant fashion. 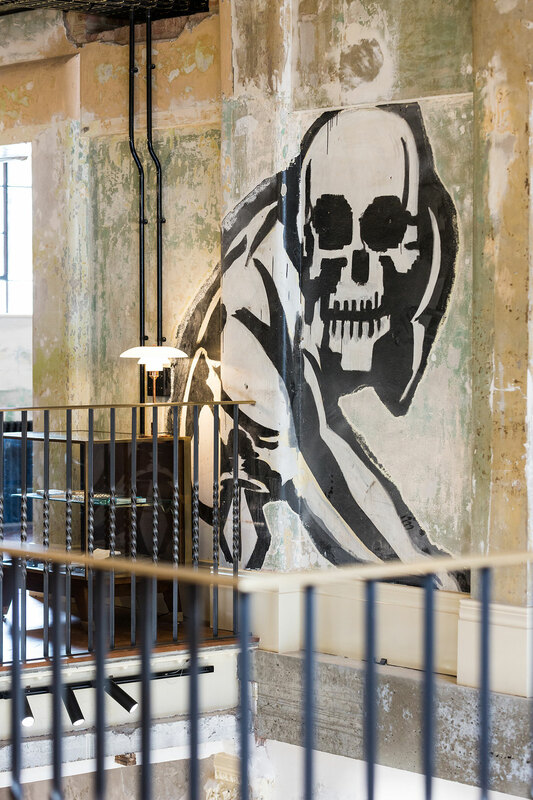 Not only does it illuminate the two floors of meeting and dining rooms below, it also heralds Brixton’s newest landmark—a fitting symbol of both the building’s glorious restoration and Squire and Partners’ creativity.